Nope, I don’t play the ukulele. I just have a small collection of them. Hubby has meant to learn to play for a while now. I used to hang the five ukuleles above my mantel in the family room, but then I tore out the mantel and fireplace, so I needed to find a new spot for them. 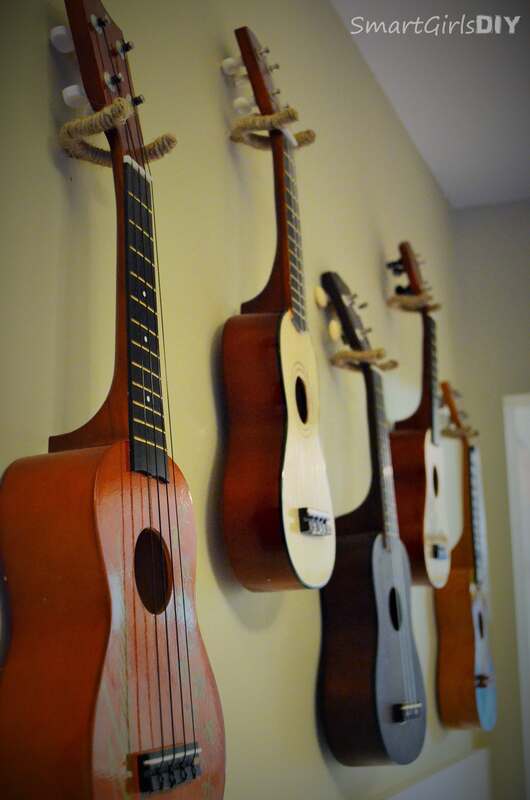 Well it’s a good thing I decided to do board and batten in my entryway (instead of finishing my family room) because it gave me the perfect spot to hang the ukuleles. How did I get them to stay up there, you ask? Easy! I used these Screw in Tool Hooks that you can find in the garage storage section of Home Depot or Lowe’s for less than a buck. When I used them in the family room, I had 2 wrapped in leather and the other 3 were hung as is. Nobody even noticed. Just saying, don’t knock yourself out over this one. But I figured the hooks would be more noticeable in the entryway, so I decided to spray paint them. Um… didn’t work. Not even a little bit. I used spray paint formulated for plastic and with primer built-in, but after 6 days (!!!) it was still a sticky disgusting mess. Not to worry, I am at Lowe’s every other day anyway, so I picked up some jute and got all crafty. 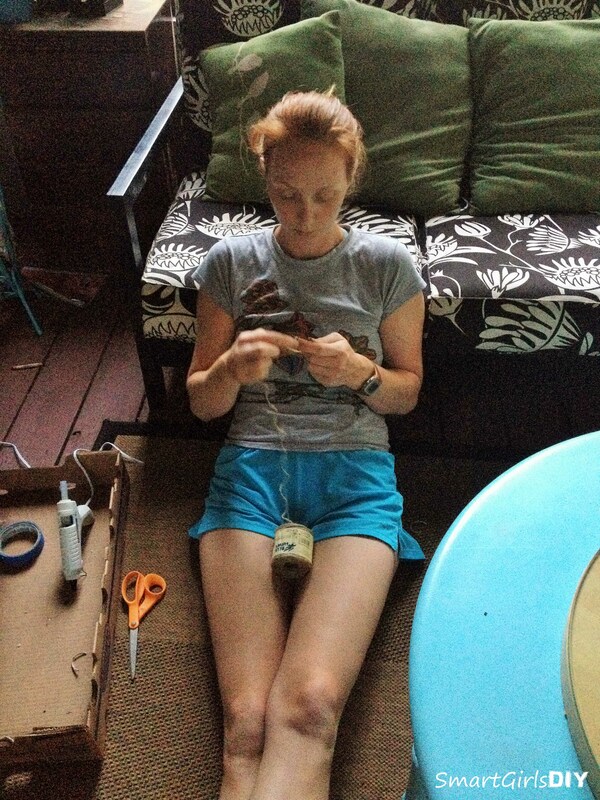 Smart Jr captured some phone pics of me winding the jute around the tool hooks. I swear they were so sticky from the spray paint that I probably didn’t even need the glue gun. 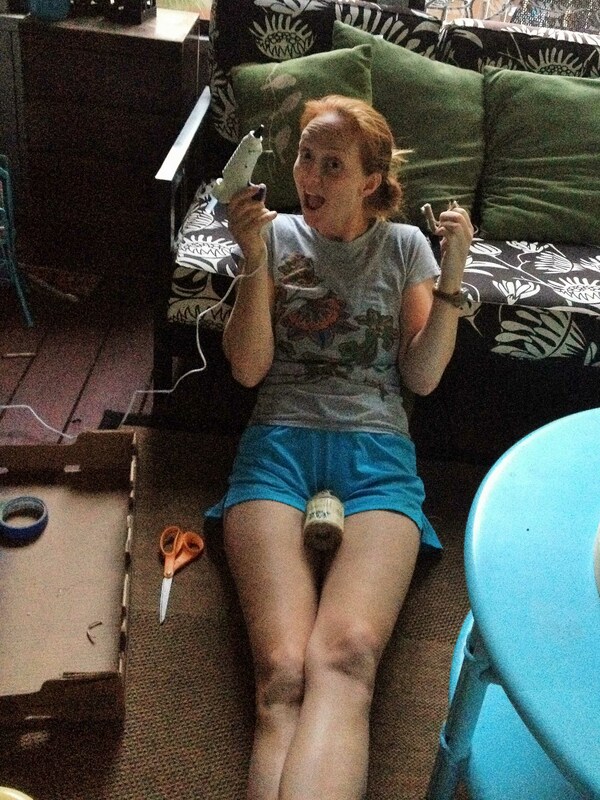 But who doesn’t love a nice glue gun!? It took about 15 minutes to wrap and glue the 5 hooks. I only used glue on the ends. They are ready to hang right away. Isn’t hot glue the best? It’s almost zero drying time. I marked the placement of the hooks, starting in the middle, and then just screwed the hooks in, no pre-drilling necessary. 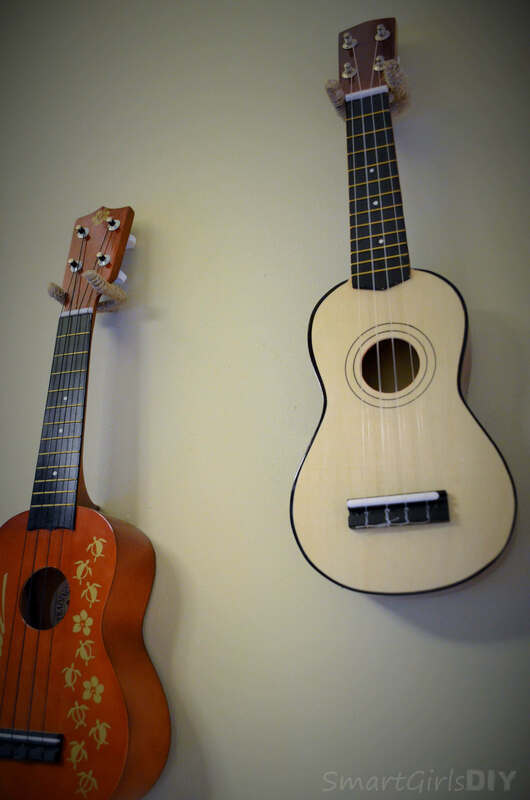 The ukuleles should sit flush up against the wall. If you try this and yours are poking out on the bottom, try loosening the hook one complete turn. That should fix it. And that’s that. Cost for the 5 hooks was about $7, which I am happy with. Now if only I could finish my family room. Sigh. « Garden Week 11: Yummy Raspberries! FABULOUS. THANK YOU endlessly. I just hung mine today, skipped the jute as Home Depot had rubber covers on theirs so that worked fine. They didn’t screw in securely to my old walls, two are loose but close enough & our ukes are so lightweight. I’m so thankful you shared this creative solution so I can get the uses off of our living room chairs…this unusable nook beside the china cabinet now SMILES with our family creativity. Cool. 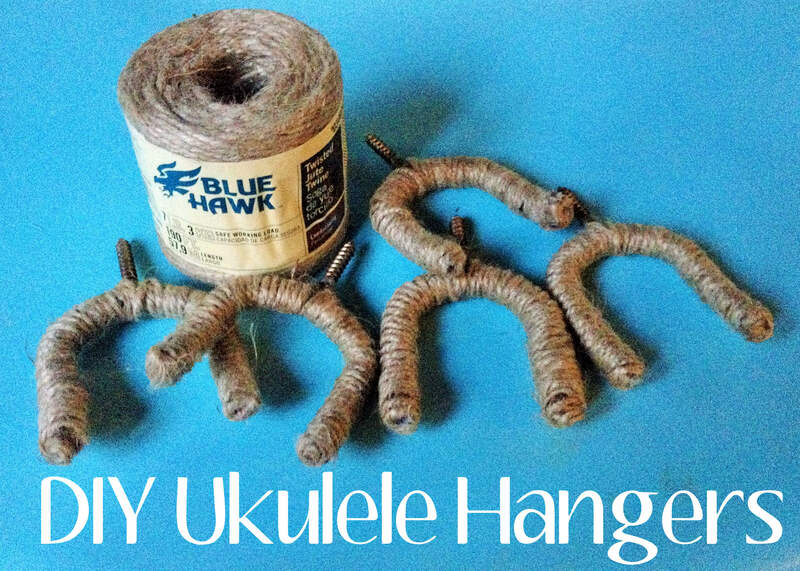 Glad to know someone out there shares my sense of ukulele hanging style!!! It is the best decorated wall in my house. 😉 Thanks for stopping by my blog! Thanks for making the time to post this. I was going to go to the store and buy an expensive one but this one is even better and probably MUCH cheaper. 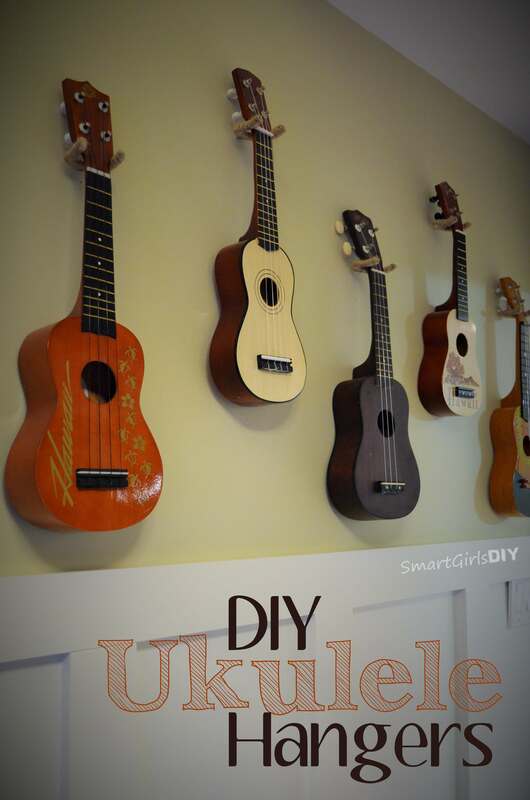 I’m so glad I’m not the only one hanging ukuleles from their wall! Thanks for stopping by Yvonne. Thank you. I’m going to do this! The jute really makes it look professional and I can do it myself! BRILLIANT!!! 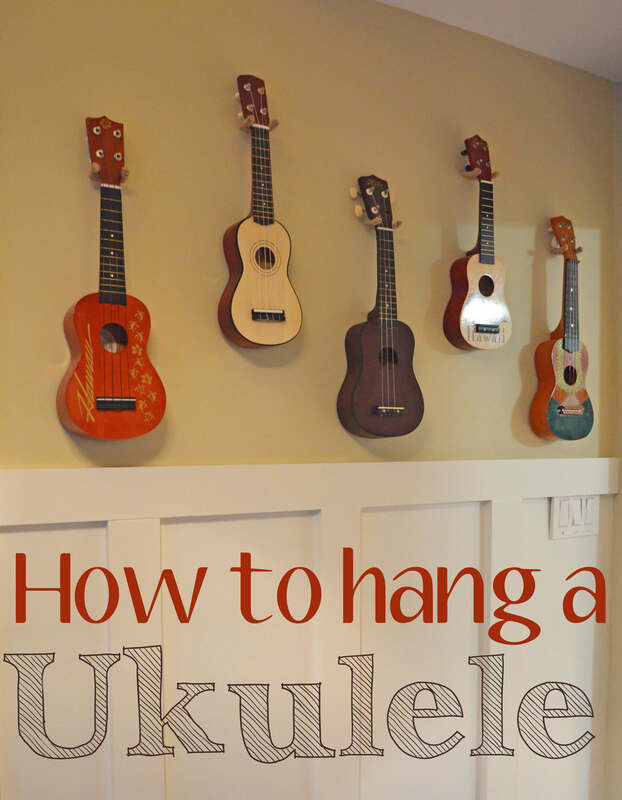 I googled how to hang a ukulele and your blog came up! I ran out that day and bought my .79 hooks from my local hardware store (the big box stores were out). Thank you, thank you, thank you!!! Hahaha Rosanna. I know! I’m not so musically inclined but I should definitely encourage my kids to learn. Thanks for stopping by! Thank you I just order a class set of 21 for my 5th grade class. I know my students are going to love them. Awesome!!! I’m sure the kids will love playing them! Totally LOVED this idea! 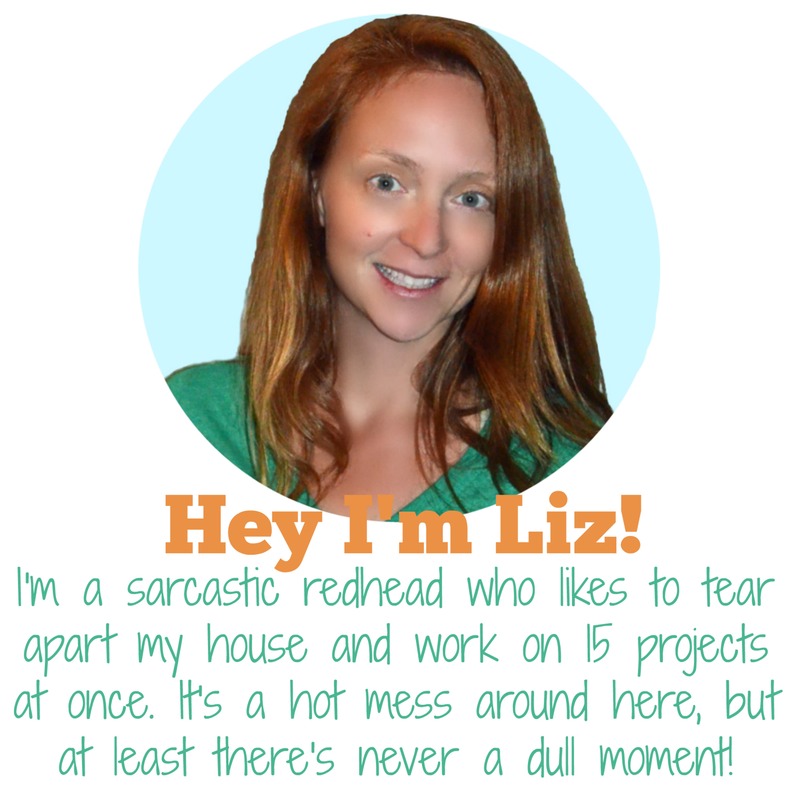 Your blog was the first thing to pop up on my screen and for good reason! 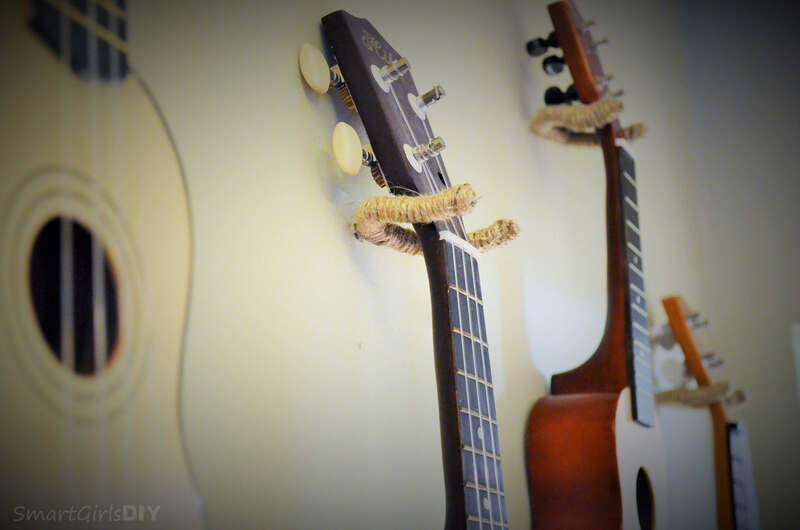 I’m going to share this idea with my cousins, (we got Uke’s for Christmas) and i’m sure they’ll enjoy having them safely on the wall where little hands can’t grab! Thanks!! Awesome Kelli! Thanks for stopping by!! Thank you for your post! I read this in France and I wasn’t sure I’d be able to do it here. 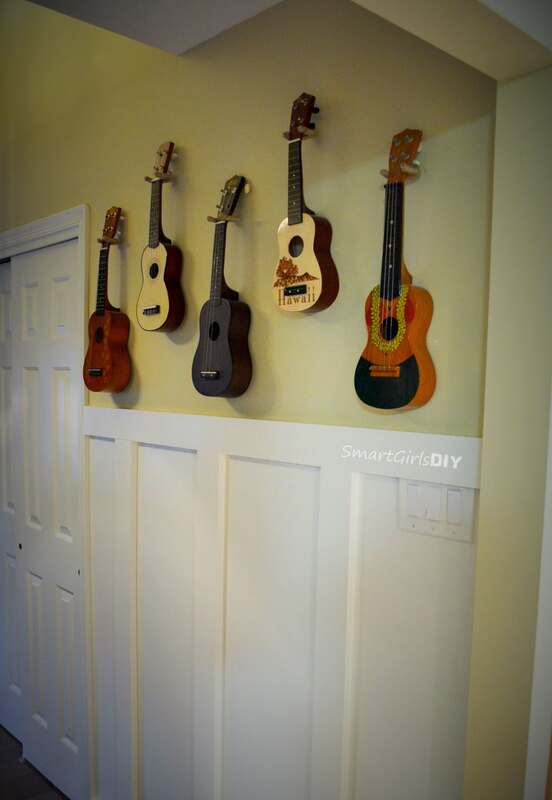 Amazing – I know have the uke up on the wall. Awesome!!! I’m so glad it worked out for you!